Popular U.S. pizza chain Papa John's faces a $250 million class-action lawsuit for blasting customers with illegal text messages. The plaintiffs allege that Papa John's (PZZA) franchises sent customers a total of 500,000 unwanted messages in early 2010. The spam texts offered deals for pizza, and some customers complained they were getting 15 or 16 texts in a row, even during the middle of the night, according Donald Heyrich, an attorney representing the class. 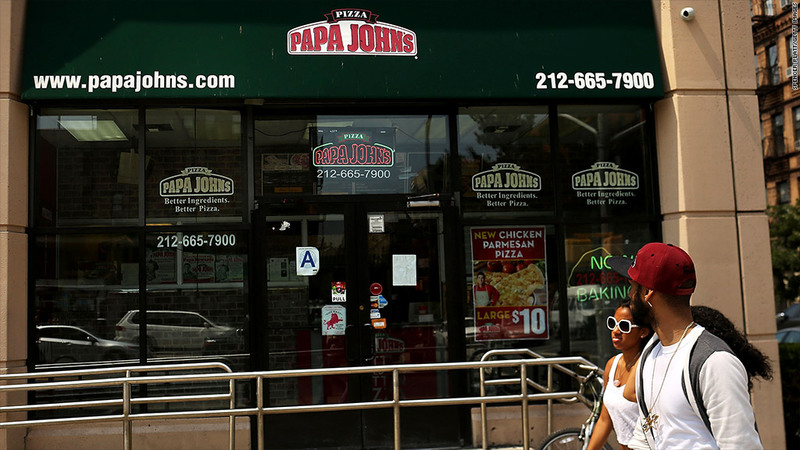 "After I ordered from Papa John's, my telephone started beeping with text messages advertising pizza specials," Erin Chutich, one of the plaintiffs, said in a statement. "Papa John's never asked permission to send me text message advertisements." The pizza franchises sent the text blasts through a mass text messaging service called OnTime4U, which is also a defendant in the case. When Papa John's was first sued in April 2010, the franchises allegedly ended their involvement with OnTime4U's text program, after the pizza company informed its corporate stores and franchisees that sending unsolicited messages to cellphones "is most likely illegal." The Telephone Consumer Protection Act of 1991 bars companies from sending advertisements via text message without a consumer first opting into the service. Related: Text messaging falls for first time in U.S.
Caroline Oyler, Papa John's head of legal affairs, said that Papa John's corporate text messaging program is not subject to the lawsuit, as the text were sent "by third-party vendors and a small number of franchisees." The class-action lawsuit could lead to the largest damages awards ever recovered under the TCPA, according to Heyrich. The plaintiffs are seeking $500 per text, but they could be awarded up to $1,500 for each message if a jury rules that Papa John's willfully broke the law. "We have noticed text message spam is increasing in part because advertisers see it as a great way to get their material directly into the hands of customers," Heyrich said. "We hope this case keeps text message spam out of cellphones." Oyler, however, said that Papa John's sees "no basis" for the plaintiff's estimate of $250 million. The nationwide class-action case was certified on Nov. 9 by U.S. District Court Judge John Coughenour in Seattle. Papa John's plans to appeal the judge's ruling, Oyler said. "We don't agree with it and will continue to aggressively defend it," she said. "We'll continue to litigate the case and defend the lawsuit and move to have it dismissed." Shares of Papa John's fell by 1% on Tuesday and have fallen by nearly 2% since the judge ruled that the plaintiffs could join together.